Varieties Try Pixie, Red Drumhead, Derby Day, Vertus & January King for year-round supply. Plant Sow direct or in modules. 1-2cm deep. Plant out approx 50x50cm, but this really depends on type. Check your seed packet. They love a rich, fertile soil & an open, sunny position. Grow Keep an eye out for caterpillars, slugs & snails & remove by hand. Winter crops may need netting against birds. Keep moist, but not wet. Mulch is not usually required. Harvest & Storage Pick young leaves as ‘greens’. Harvest non-hardy varieties before the first frosts. Store in boxes of straw. Try making sauerkraut or kim chi! Biodynamic tips Leaf crop. Sow on a waxing moon. Plant & weed on a descending moon. Harvest on an ascending moon. Harvest for storage on a ‘flower’ day. Natural remedies Encourage slug-loving animals like birds, toads & hedgehogs into your garden. ‘Beer traps’, copper collars and barriers also deter slugs & snails. Wormwood tea deters cabbage root fly. Tansy & elder liquid manure repel the cabbage white butterfly. Aromatic herbs attract the caterpillar-loving parasitic wasp. Planting: There really is a cabbage for all seasons, but you need to make sure you choose the right cabbage for the right time of year. Winter cabbages, such as ‘January King’ will stand through the coldest months offering beautiful red-tinged leaves in the middle of winter. ‘Vertus’ is another winter favourite – a savoy-type crinkled cabbage with dark-green chlorophyll-packed leaves that can be harvested right through winter and into early-spring. Sow in late-spring for dense heads to pick and store before the first frosts or sow in early summer for looser, frost-resistant heads that stand through winter. Delicious with or without a dense ‘heart’, these cabbages may need protecting from caterpillars in the early stages and birds in the later stages! Spring cabbages, such as ‘Pixie’ or ‘Durham Early’ offer tender leaves from early-spring through to early-summer, well before most other veg are ready and filling that infamous ‘hungry-gap’. They’re also fantastic at avoiding the onslaught of bugs, maturing just before they arrive, but you may need to protect or share with hungry birds. Sow in late summer and plant out in mid-autumn for an early-spring harvest. You can sow direct, but we sow all our varieties in modules at a depth of 1-2cm, before hardening off and planting out at approx 50x50cm depending on type. Check your seed packet for specific instructions. Cabbages like a rich, fertile soil that’s been prepared with well-rotted manure or compost and an open, sunny position. Plant out no deeper than the seedling has been growing in its pot and don’t earth-up too much around the stem. This will help deter the cabbage root fly. Avoid clubroot by practising crop rotation. Keep cabbages moist but not wet, especially in prolonged dry weather. Mulch is not usually required and will only encourage slugs. Weeding and hoeing are necessary until the leaves of the cabbage are big enough to naturally shade-out any weeds. Birds: You will probably need to net against pigeons and other hungry birds, especially in the colder months… unless you don’t mind sharing! Caterpillars: During the summer and autumn, you can also net against the Cabbage White butterfly, whose caterpillars are a real nuisance. If your cabbages do come under attack then your best bet is to pick the caterpillars off by hand. Slugs and snails can also be a problem, especially in damp, mild summers. These too are best hand-picked at dusk on damp days. You can also set ‘beer-traps’, use copper-rings or create a barrier with crushed egg-shells or gravel. Even sandpaper attached to the sides of a raised bed can deter them. Cabbage root fly love young, juicy plants. Although we’ve never had this problem in our garden (touch wood! ), I do know that you can protect your little cabbage babies with a 10cm felt or paper ring (even old carpet underlay) placed around each plant and avoid excessive earthing up around the stems. 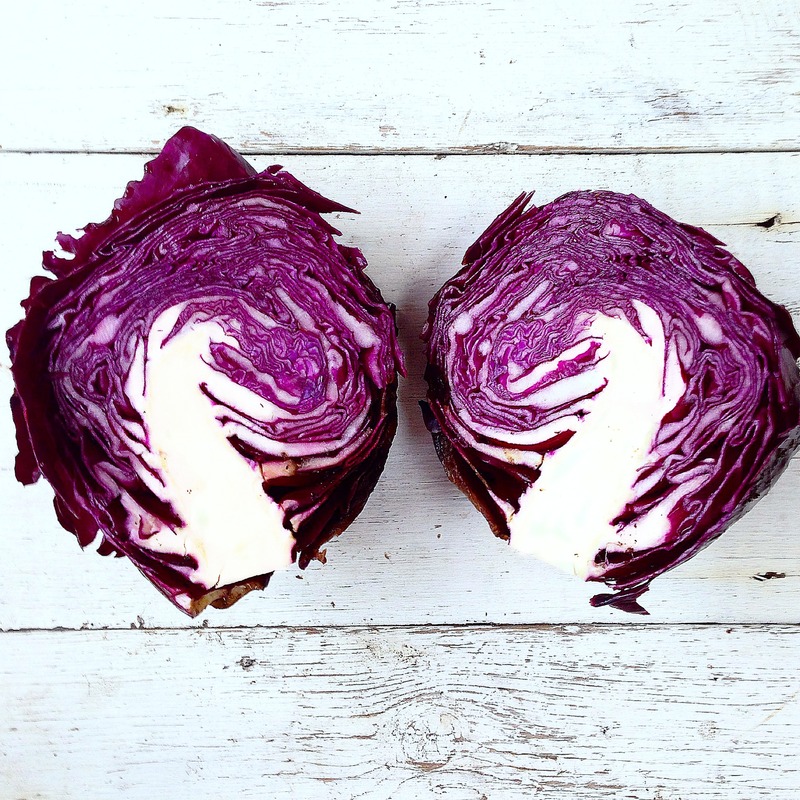 Cut cabbage leaves as ‘greens’ whilst the heart of the cabbage is still forming. Autumn cabbages need to be harvested before the first frosts and stored in boxes of straw to keep them cool and dry. Try pickling your cabbage – sauerkraut and kim chi are classic ways of preserving cabbage through the winter. Harvest when the moon is ascending, so that all the energy and goodness of the plant is drawn into the upper parts (the bit you’re going to eat!) Harvesting for storage is best done on a ‘flower’ day. Encourage slug-loving animals such as toads, frogs, hedgehogs and birds into your garden by offering food and shelter through the winter. Elder liquid manure is a natural insect repellant. Spray it on the leaves and soil around cabbages to deter cabbage white butterflies. Tansy grown in and around your cabbages acts as a companion plant, repelling the cabbage white butterfly. Fennel, dill, coriander, sage and parsley attract beneficial insects into your garden, such as the parasitic wasp. Harmless to us, but deadly to the caterpillars of the cabbage white. Cabbage root fly can be treated with undiluted wormwood tea. Brew as you would normal tea and place 1tsp at the base of each plant. 3 doses, once every hour. This isn’t really a natural remedy, but did you know that red cabbage makes the best natural electric-blue dye? Simply simmer 500ml water with 1 mug finely grated red cabbage & 2 tbsp cider vinegar for 20 mins. Strain the liquid into a mug and stir in 1 tsp bicarbonate of soda and there you have it. You could pop a white-shelled, hard-boiled egg into the liquid and soak for 30mins or more. Remove, dry, admire, peel and eat! Health Benefits: The humble cabbage is incredibly good for you. One of the joys of growing it are the ‘homegrown’ health benefits that it brings in the depths of winter and into the infamous ‘hungry gap’ of early-spring. Overflowing with beneficial phytonutrients, cabbages are said to support the health of the stomach and may help to heal stomach aches and ulcers, even stomach cancer. Also known to regulate high blood pressure and cholesterol, as well as containing antioxidant and anti-inflammatory properties, the cabbage really is a fantastically nutrient-dense veg. Great to grow and wonderful to eat! What excitement! I’m going to now dye everything electric blue! Fabulous blog. Beautifully written. Wow!! !